Vinaigrette Salad: made out of root vegetables, combined with a bit of tang from pickles, dressed in sunflower oil and garnished with fresh parsley! 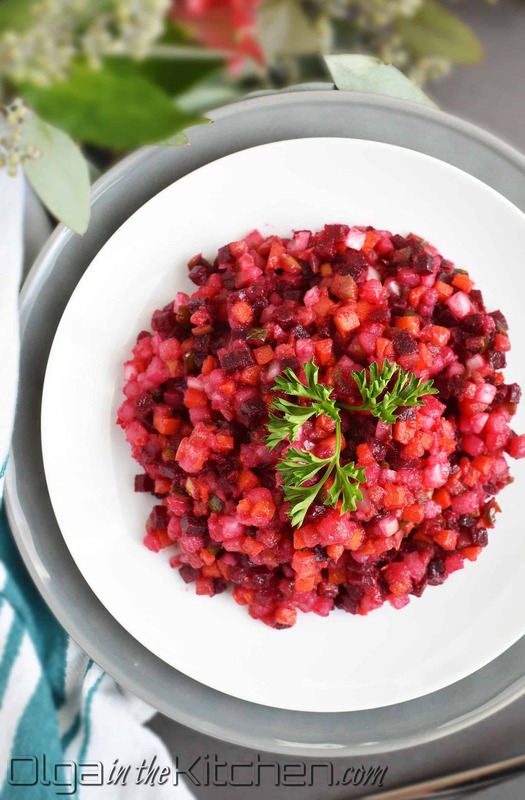 This salad is healthy, gorgeous and almost a requirement for the holidays! 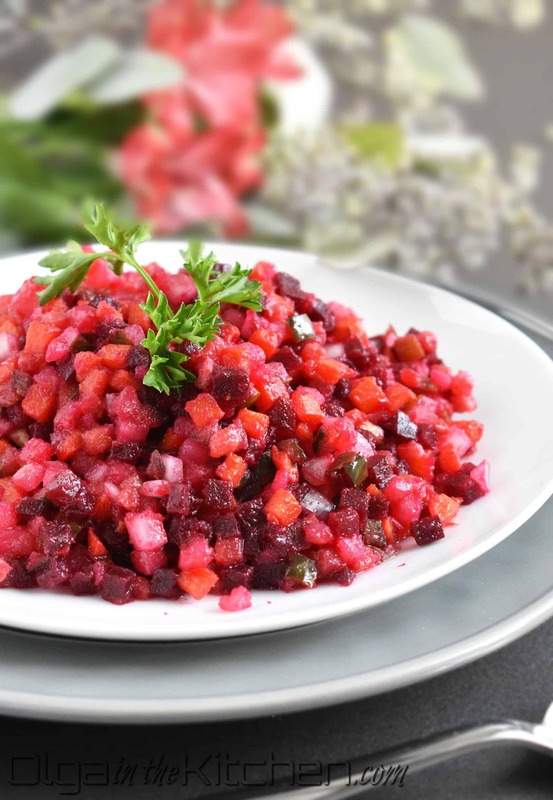 The ruby red root vegetable makes this salad vibrant and stunning! 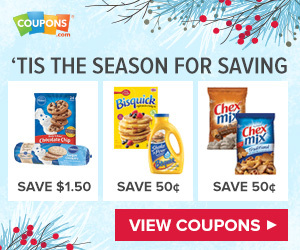 A beautiful addition to your holiday table! This salad tastes better next day and the next day after the pickles shared their tang with the other ingredients in the bowl. 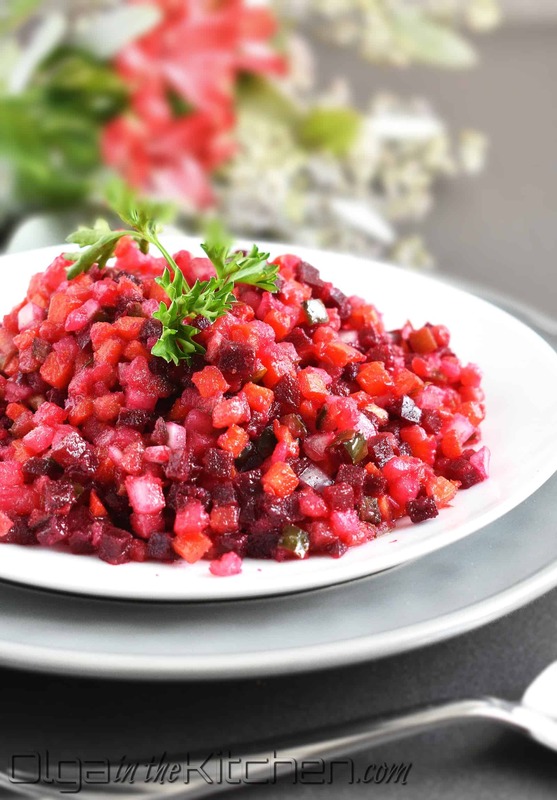 If you love beets, you are going to love this traditional beet potato salad! 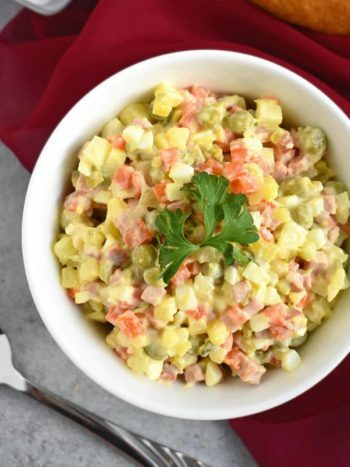 This salad is a staple of Slavic cooking. It’s made out of root vegetables. 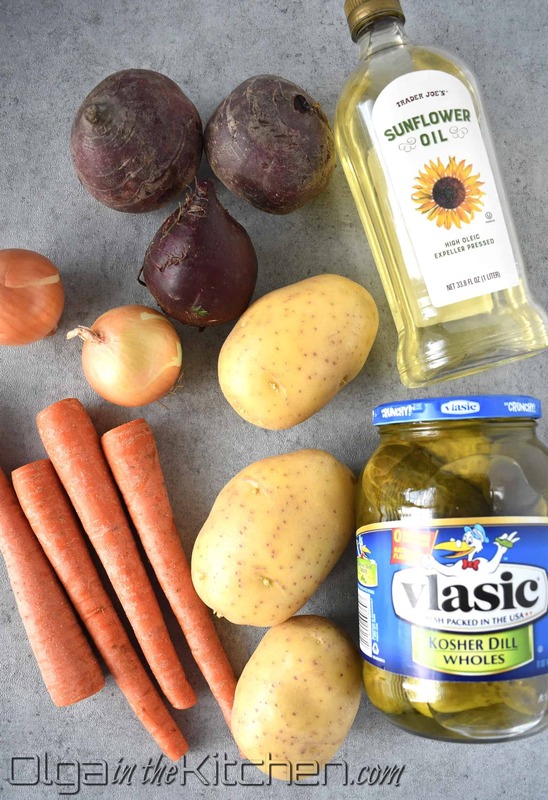 The main idea is to use beets, potatoes, carrots and pickles. A lot of times people add sauerkraut, beans or peas, but I keep it classic and never add any of those things to the salad. The amount of pickles in ingredients add plenty tang to the salad and you don’t even need the vinegar or salt. The pickles add a nice crunchy texture to the salad. If you want it extra tangy, you’re welcome to add a bit of vinegar and salt to taste. Dressing the salad with sunflower or grapeseed oil are the best choices. These oils are light in flavor and don’t overpower the salad. Garnish the salad with fresh parsley or dill just before serving! 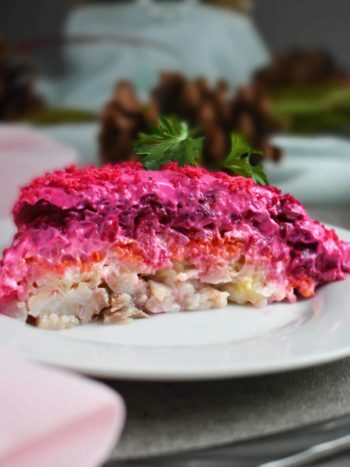 The Vinaigrette Salad is very similar to the Olivye salad – another staple among Slavic gatherings. Both salads are very similar in ingredients, texture and the way they are prepared. It might look a bit time consuming, but it’s not especially if you’re using the Chop Wizard. I highly recommend using the Chop Wizard! It will save you time and make your salad look gorgeous with all the cubes similar in size. Also, keep in mind to not overcook the vegetables. Follow the cooking time in instructions below. 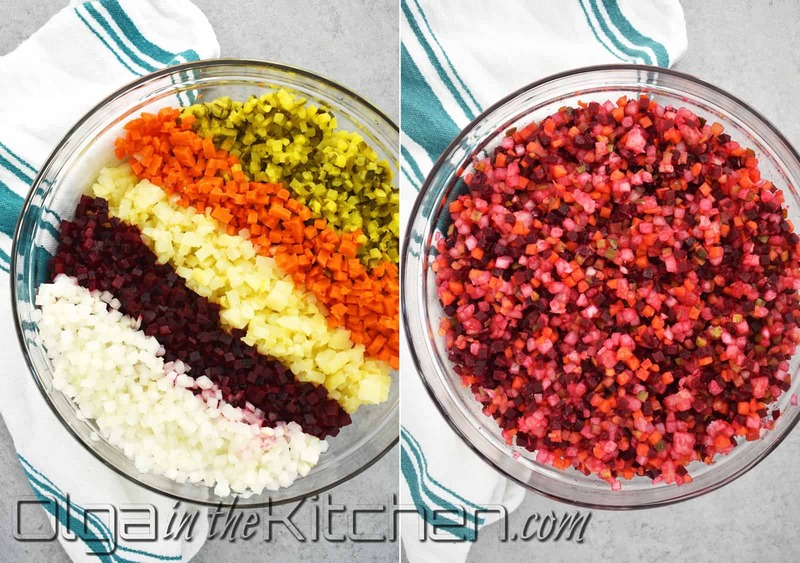 Overcooking any of the root vegetables will make it complicated to slice and chop and it will make the salad look mushy. Do not peel the vegetables. In a medium pot, place 3 large potatoes and 4 medium carrots. Cover with water, bring to a boil over medium-high heat. Cook the carrots for 15-20 mins and take out with kitchen tongs or couple forks, and potatoes for 30-35 mins. (Pierce with knife to check if vegetables are cooked through before taking them out. Do not overcook!) 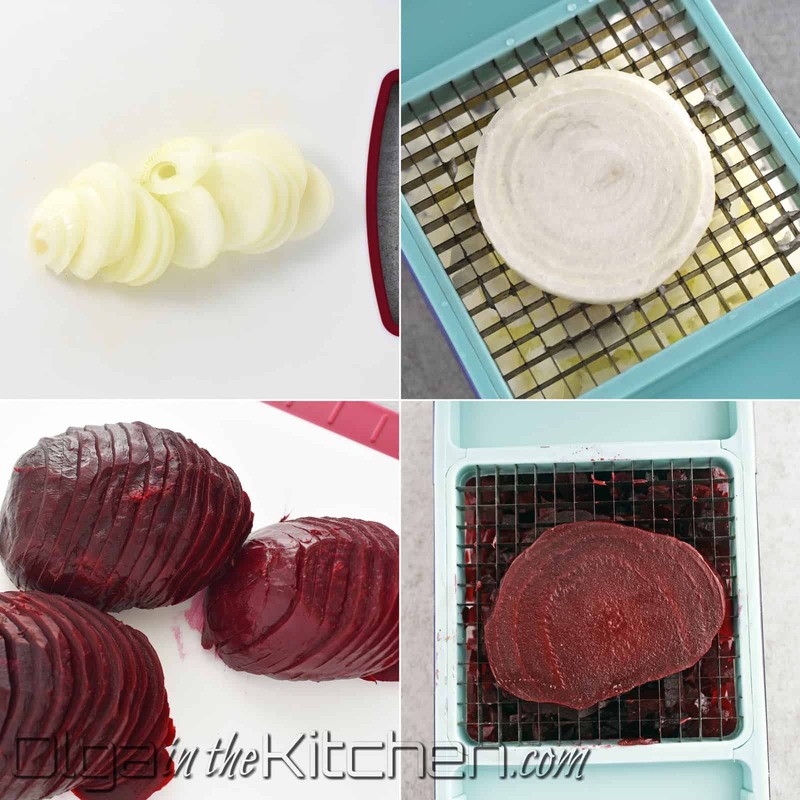 In a small pot, place 3 large beets covered with water, bring to a boil and cook for 45-60 mins until they can easily be pierced with a knife. Drain vegetables and refrigerate or let them stand at room temperature to cool before peeling. 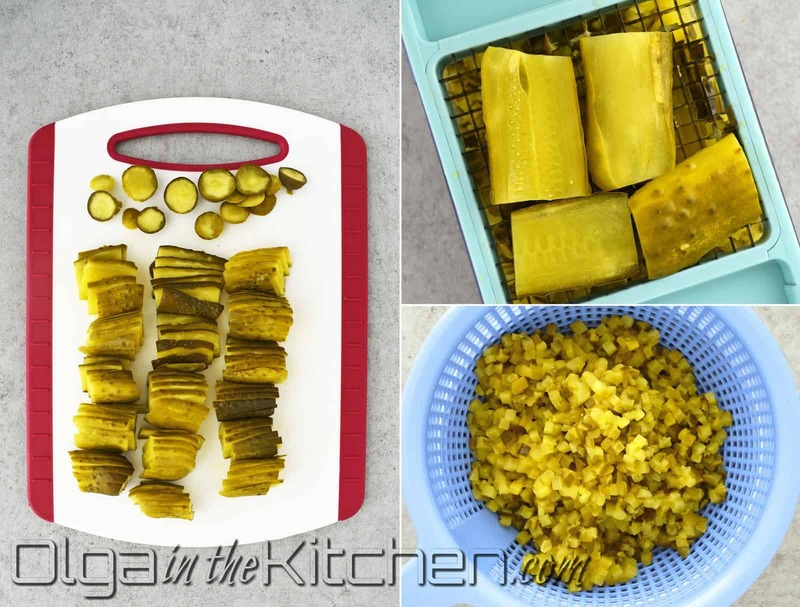 Thinly slice 46 oz jar kosher pickles (8-9 pickles). Chop the pickles onto the Chop Wizard and transfer into a sieve lined with a soup bowl. Set aside for pickles to release the excess liquid. Peel potatoes and carrots. 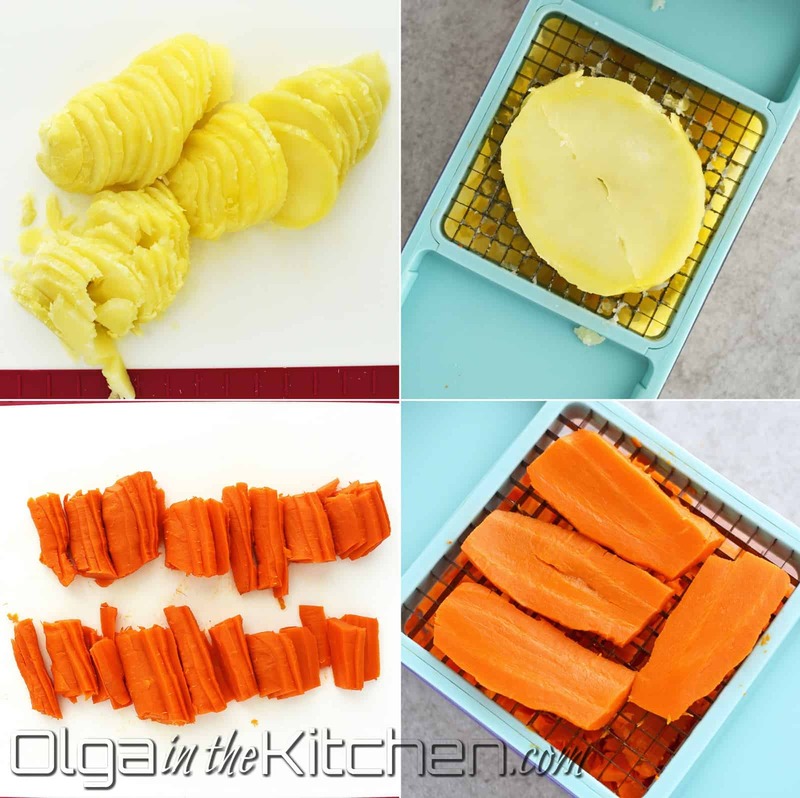 Thinly slice 3 large Yukon potatoes and 4 medium carrots. 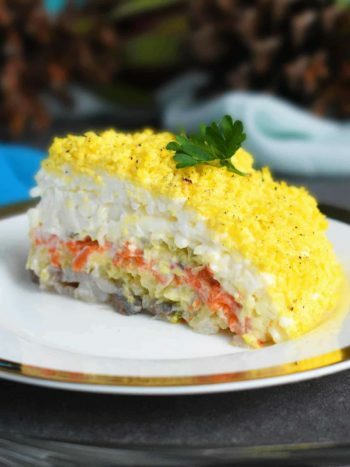 Chop potatoes and carrots onto chop wizard by placing in single layer. Transfer cubed vegetables into a large bowl. Do not let them get squeezed in the box. Slice 2 small onions. Chop using chop wizard and transfer into bowl with salad. Peel, slice and chop 3 large beets. Add to the salad. Squeeze the juices from the pickles with your hands before adding to the salad. (You don’t want your salad dripping with excess amount of liquid). Gently stir the salad with a spoon. Potatoes tend to get sticky, so you’ll kind of have to break them. Refrigerate the salad without the oil. Dress into sunflower oil any amount of the salad before serving. Taste before serving. Add vinegar and/or salt if you feel like it needs more tang! This salad is good up to 5 days in refrigerator! 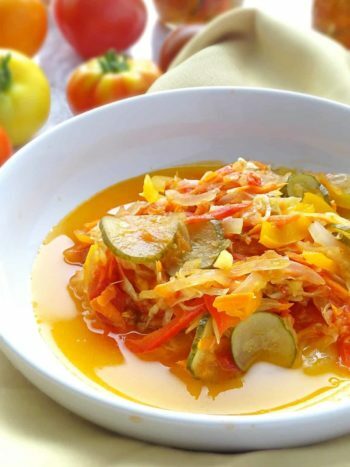 Vinaigrette Salad (Vinegret – Винегрет): made out of root vegetables, combined with a bit of tang from pickles, dressed in sunflower oil and garnished with fresh parsley! Cook the vegetables: Do not peel the vegetables. 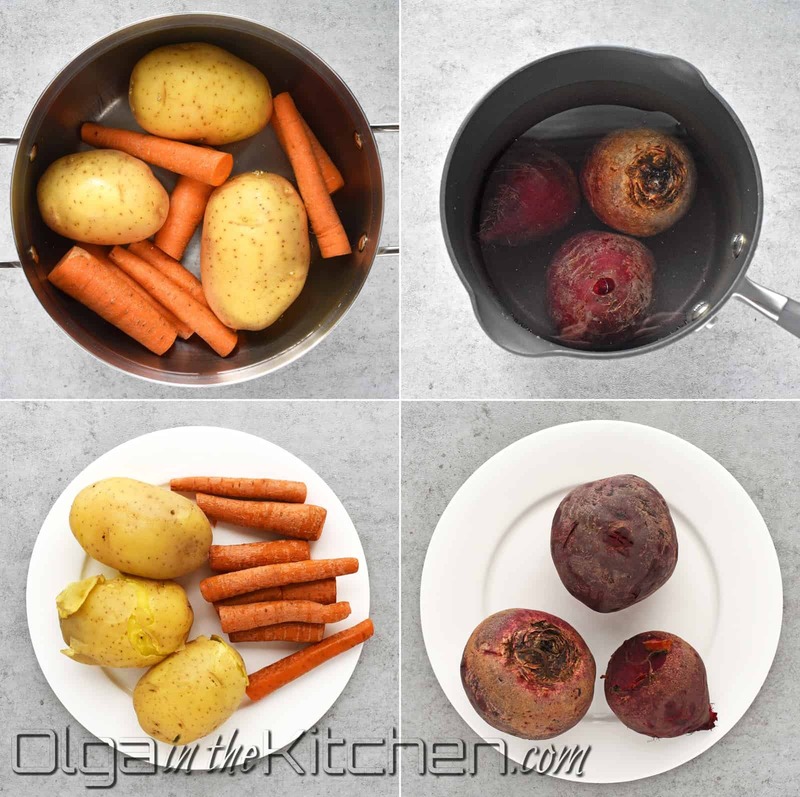 In a medium pot, place 3 large potatoes and 4 medium carrots. Cover with water, bring to a boil over medium-high heat. Cook the carrots for 15-20 mins and take out with kitchen tongs or couple forks, and potatoes for 30-35 mins. (Pierce with knife to check if vegetables are cooked through before taking them out. Do not overcook!) In a small pot, place 3 large beets covered with water, bring to a boil and cook for 45-60 mins until they can easily be pierced with a knife. Drain vegetables and refrigerate or let them stand at room temperature to cool before peeling. How to Make Vinaigrette Salad: thinly slice 46 oz jar kosher pickles (8-9 pickles). Chop the pickles onto the Chop Wizard and transfer into a sieve lined with a soup bowl. Set aside for pickles to release the excess liquid. Slice 2 small onions. Chop onto wizard and transfer into bowl with salad. Peel, slice and chop 3 large beets. Add to the salad. Squeeze the juices from the pickles with your hands before adding to the salad. (You don't want your salad dripping with excess amount of liquid). Gently stir the salad with a spoon. Potatoes tend to get sticky, so you’ll kind of have to break them. Refrigerate the salad without the oil. Dress into sunflower oil any amount of the salad before serving. Taste before serving. Add vinegar and/or salt if you feel like it needs more tang! This salad is good up to 5 days in refrigerator! © Olga in the Kitchen. All images & content are copyright protected. Please do not use my images without permission. If you want to republish this recipe, please re-write the recipe in your own words, or link back to this post for the recipe. Some of the links above are affiliate links, which pay me a small commission for my referral at no extra cost to you! Thank you for supporting Olga in the Kitchen! This salad is so gorgeous! It would definitely be a hit at my Christmas dinner, thank you for posting it just in time for Christmas! I made this salad for Valentine’s Day (which is tomorrow) and we only have like 1/4 left of it lol It was so good, we couldn’t wait until tomorrow. Might be making more tomorrow though. 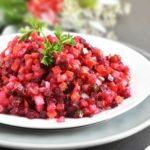 The best beet salad!